This blog is about living in the jungle with modern amenities! I have crash course posts on Solar Energy, Building Off-Grid, Easy Satellite Internet Access, Water Supply Considerations, the Domestic Cats’ Life in the Jungle and many more educative and fun articles. 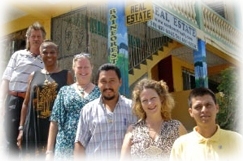 You will also learn about Belize, its facts and cultures. I also blog about other stuff such as Expat Life, and things to consider when contemplating living abroad such as Health Insurance! Have a little time on your hands? Complete this fun jigsaw puzzle! Coco Morgan’s Weblog – A Gringo Moving to Belize! ExpatExchange ~ For those living, or planning to live, abroad. Provides resources and in depth information to hundreds of countries. The Political Appropriation of Caves in the Upper Belize Valley – by Michael J. Mirro. An incredible thesis of Barton Creek cave, other caves, and the Mayan History. At the first rain, following a drought, the flood flies invade! Those ‘flood flies’, which look a lot like ants, are ‘winged termites’. They are about ½” to 1” long and have 2 sets of wings. This is a phenomenon that occurs a few times a year. This year it happened on May 29th, when tropical storm Arthur brought a deluge on Belize. The last time it rained here at Barton Creek was on March 5th. Everything, including the jungle, was very dry, dry enough that a lot of wildlife were lower in the mountains, nearer the creek. On that day, the rain started in the early afternoon, and it came down hard! But it felt so good as you could feel the dust being washed off everything such as the trees, the rocks, the truck, the house… it smelled so clean. But, in the early evening, at dusk, the little pests arrived! Here’s a very good video by Calvary Chapel Murrieta. After clicking on the link, then click on ‘flood flies’. … on the floors, furniture, ceiling fans, just about everywhere. The next day, all are dead, and it is then cleaning time! That is also quite exasperating as those wings are very small and light and therefore a nightmare to sweep. HUNDREDS (THOUSANDS?) OF LITTLE WINGS EVERYWHERE! But the best is that our water tanks are now full with the best water source when living off-grid. And the worst on this occasion is that some parts of Belize got hurt really bad and are still in the process of cleaning and rebuilding. 1 ~ Living Comfortably In The Jungle Of Central America! 2 ~ Producing And Storing Your Own Electricity, You Have The Power To! 9 ~ Living in Paradise! But… Where Is It? If I read it correctly, those insects come AFTER the rains? They look large from the photo of a group on the floor. Do they bite? that second last photo is a mean looking warrior. It has pincers at its mouth I notice. Just for comparison, in Malaysia we experience this “phenomenon” (different insects though and smaller sized) but they arrive a few hours before a rainfall. If they arrive during nightfall, the lightings attract them and they are buzzing very close to the lightings. So, instead of having to insect-proof the entire house or to waste money on insecticide sprays, what we normally do is to leave only the porch light on, shut the door and watch TV in semi-darkness. LOL! Hi tropicat – sorry to hear you are departing Belize. I am becoming interested in transplanting there from the States. Understanding that the jungle is filled with critters of all kinds, my family has a particular concern regarding mosquitoes. I have heard elsewhere that much of the district of Cayo has a very limited mozzie problem. Is this only a relative statement or are there actually not many in the area? Sounds like the lake fly hatch every May near Lake Winnebago in Wisconsin…the flies don’t bite, just make a BIG mess!!! They have 2 main hatches in May and then pretty much die off…how often do you get downpours? Does this happen every time? If so, what a mess!!! Oh well, a few times a year I think I could handle. Yes, what a mess!!! We do get downpours regularly during the rain season, but those flies only hatch after a long dry spell. So this phenomena happens no more than 2 to 3 times a year, and is easy to deal with as it only last one or two evenings. You mentioned the termites are all dead the next day, so their lifespan is short or is it because of insecticides you used beforehand? And do they lay eggs or anything before they die? Sorry for the delay in replying to your question. Hello! I wonder if these termites cause the same type of problem that regular termites do? Do they eat your house?! I ask because I think I just got a swarm of these in my back garden in New Mexico. We’ve had a drought forever, and now it just rained and these bugs appeared. No they don’t eat your house (wood). They actually die very shortly after loosing their wings. In malawi, Central Africa. They are a source of food in some way. We leave the porch light on and pour water on the floor. The light attracts them and after they fly around it they eventually fall off to the floor and get trapped in the water. We pick the up, FRY them together with the wings, Let em dry off and remove the wings. after that. Its time for dinner. lol. Try it. though i dont personally like them. Mind you, their are too types. Small ones(which we dont eat) and the ‘big’ ones, like the one in the picture. those we eat. That is too funny! I’m not sure I would want to eat them, but health wise they are probably very good for you… mix in a sauce with some pasta it would be just like meat ?!?! Living In Paradise! But… Where Is It?